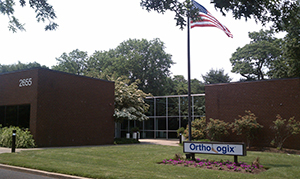 Orthologix has opened the first of its kind Orthotic and Prosthetic Center of Excellence in Bucks County, located at 2655 Interplex Drive, Suite 101 in Trevose, Pa. The new facility houses Orthologix corporate headquarters as well as an education center, gait lab, and technology-linked patient care suites. The Jaeco WREX (Wilmington Robotic Exoskeleton) is a functional upper limb orthosis designed to enhance movement for individuals with neuromuscular disabilities. Its state-of-the-art construction utilizes a lightweight exoskeleton that approximates normal human anatomy. Linear elastic bands are used both for balance and to assist movement in three dimensions against the effects of gravity. 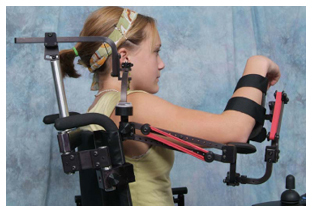 These features provide for exceptional range of motion to aid in a variety of therapeutic and daily living activities. Designed at A.I. DuPont Hospital for Children, the WREX is for patients with neuromuscular weakness such as muscle disease, cerebral palsy, spinal cord injury, multiple sclerosis and amyotrophic lateral sclerosis that effects upper limbs. It can also serve as a cost effective exercise/therapy device for people recovering from stroke. 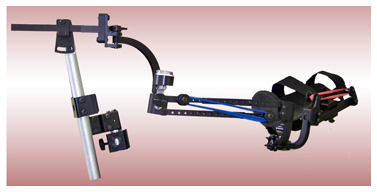 The WREX can be attached to most common wheelchairs and mobility seating systems utilizing one of the three Mount Bases provided with the arm. These are the same attachment systems that are the basis of JAECO's Mount Relocator. The WREX can be assembled as left or right. The size is adjustable to fit most children through adult arms. "Passive Exoskeletons for Assisting Limb Movement"
"Design and Testing of a Functional Arm Orthosis in Patients with Neuromuscular Diseases"
"A Body-Powered Functional Upper Limb Orthosis"
When she was a mechanical engineering student at Villanova University, Orthologix practitioner Kacy Moran Powers, CO, worked on helping with the development of the Wilmington Robotic Exoskeleton (WREX) during an internship in the Biomedical Engineering Research Department at Nemours/Alfred I DuPont Hospital for Children. She remained at Nemours for five years and co-authored a published article about the WREX, "Design and Testing of a Functional Arm Orthosis in Patients with Neuromuscular Diseases," found in the case study section of this newsletter. She also has experience with the Wilmington Scoliosis System. Powers also is a graduate from the certificate program at the Northwestern University Prosthetic-Orthotic Center (NUPOC), Chicago. She intends to continue her studies to complete her prosthetics certification. "HHS Announces Proposed Changes to HIPAA Privacy Ruler"
A Notice of Proposed Rulemaking concerning the accounting of disclosures requirement under the Health Insurance Portability and Accountability Act (HIPAA) Privacy Rule, is available for public comment. The proposed rule would give people the right to get a report on who has electronically accessed their protected health information. The U.S. Department of Health and Human Services' (HHS) Office for Civil Rights (OCR) is proposing changes to the Privacy Rule, pursuant to the Health Information Technology for Economic and Clinical Health (HITECH) Act. HITECH is part of the American Recovery and Reinvestment Act of 2009. "This proposed rule represents an important step in our continued efforts to promote accountability across the health care system, ensuring that providers properly safeguard private health information," said OCR Director Georgina Verdugo. "We need to protect peoples' rights so that they know how their health information has been used or disclosed." People would obtain this information by requesting an access report, which would document the particular persons who electronically accessed and viewed their protected health information. Although covered entities are currently required by the HIPAA Security Rule to track access to electronic protected health information, they are not required to share this information with people. The proposed rule requires an accounting of more detailed information for certain disclosures that are most likely to affect a person's rights or interests. The proposed changes to the accounting requirements provide information of value to individuals while placing a reasonable burden on covered entities and business associates. People may now read the proposed rule at: http://www.federalregister.gov/and submit comments to http://www.regulations.gov/ (search for Proposed Rule) through August 1, 2011. Please feel free to submit your questions on the WREX as well as any other issue you would like addressed.